How are you going to build an email list of highly engaged subscribers? How to build an email list and keep your subscribers engaged! Email marketing is still golden and still one of the most effective ways to communicate with your target customers. Even though there are many advanced methods and strategies for marketing, email marketing still stands as one of the most effective one-to-one modes of communication. With blogs, social media and other avenues, we have a mass reach – but they get personal only to a certain level. Here’s where email marketing comes to rescue. But before you could use email marketing to market your business and products, you’ve got to build an email list. Not the easiest thing on the earth, you know. But once you build a list, say a really BIG list, the story doesn’t end there. Why is it important to keep your subscribers engaged? A responsive list is one where your subscribers are really engaging. They eagerly open your emails, click on your links, reply to your emails and take all sorts of “positive” action that helps your business. On the other hand, if your list is unresponsive, a majority of your subscribers do not take any action – they don’t open your emails, click links or even bother. Such subscribers are dead weight; pardon the language but that’s literally it because, most email autoresponders charge you on a number basis. That is you pay for the number of subscribers you have and as your subscriber number increases, the money you pay also increases. If you have a lot of un-responsive people in your list, then you are paying for the dead weight. You are wasting your money. Hence it is highly important to pay attention to the responsiveness of your email list (or how actively engaged your subscribers are). Review your subscriber list often! In order to keep your list “sharp” in this sense, you can review your list on a monthly basis and delete those subscribers who are unresponsive. For instance, review your list every month and delete those subscribers who have not opened any of your emails over 2 months. You can use the “last mail opened” (or something similar) search feature to filter those subscribers and then delete them. However, this is in fact additional work. If you manage to so some legwork before you add those people as your subscribers, you can avoid much work load in analyzing and removing them manually afterwards. Not only that, having a responsive email list help increasing your open rates. If you have a list of 1000 people while only 100 of them are actively opening your emails every time you send them your open rate is going to be just 10%. On the other hand, if you have a list of only 200 people and 100 of them actively open your emails, your open rate will be 50%. See the difference? That’s huge. Why should you worry about open rates in the first place? OK this is just a metric and not even accurate. You know why? We can find the answer to this by learning how email open rates are calculated. Email autoresponders (all of them, including the popular ones like Aweber and GetResponse) put a small, invisible image in every email you send out. Once your subscriber opens the email, the image is downloaded from their server to be displayed in their emails. This download is recorded and an open is counted. So if your email is either only text or if the subscriber has not enabled images, his/her open won’t be counted unless he/she clicks a link in your email (provided, there’s a link in your email). But still it gives you an idea of how responsive your list is, and how engaging they are. Having a responsive list is a crucial part of your email marketing campaign. Further, if your list is responsive, you can be rest assured that your list is of high quality and that your email marketing campaigns will do well (in terms of action taken by your list subscribers). So now you know how important it is to keep your subscribers engaged, right? It is not about the numbers but it is about the “quality”. You cannot boast about your email list size if you have 10K subscribers while 95% of them don’t even bother to open your emails. Rather you can, for sure, boast about having a small list of 1000 subscribers who are highly responsive and engaging. Responsive email list give a meaning to your email marketing campaign. If your list is not responsive, your email marketing efforts will go waste. And who wants that, right? How to ACTUALLY build a highly engaging email list? why it is important to care about having a responsive email list in the first place. connects with you (assuming that you connect with your list). This is simpler to understand, right? In fact this is pure common sense. If the subscribers in your list did not give their consent by clicking on the confirmation link you sent them, you cannot expect them to be responsive! So what is double optin? Let’s say you have a wonderful squeeze page (like this ;)) offering an e-book or a free course in exchange for the email address of your target audience. Or let’s say you silently add everyone who leaves a comment on your blog to your list (by ticking a check box that says “join my list” by default). Now whether your target prospect himself gave the his/her email list or whether you added him/her doesn’t matter. You need to ask your subscriber once again to confirm whether you have his/her consent or not. This can be done by turning on double optin – most email autoresponder services like Aweber, GetResponse etc. have this option. Simply make sure that you have turned on this option. And the rest will be taken care of. How to turn ON double optin? For instance, here’s how to do it in Aweber (and I am sure this is pretty much similar in any email autoresponder service). Login to your Aweber account. From the drop down next to Current List, choose the list you want to turn double/confirmed optin ON and choose settings. Then scroll down a bit to Confirmed Message settings and turn ON the “Send confirmation message for Aweber sign up forms”. You can also turn ON the confirmation for imports – it depends on your list though. You can reduce the number of spam complaints. People who have given their consent to accept your email will not report your mails as spam (mostly). You can expect your subscribers to actually open your emails and take action if they have shown some sort of interest in your beforehand; and clicking the activation link (double optin) is a nice indication of this. Turning on double option doesn’t take more than a couple of seconds actually. On a side note, I agree that there’s a lot of debate on whether single optin (where the subscriber doesn’t have to confirm and the list owner can already send him/her email) or double optin – I am not going deep into that. Both of these options have their own pluses and minuses. But if you want to build a responsive email list, you should turn double optin on. There are various ways to get people to enter their email address into a form and yes you can add anyone as your subscriber by silently keeping that subscribe button ticked (wicked). If they don’t fall in love with you (even before they leave their email address with you) they won’t be responsive. How can you make your readers fall in love with you and then subscribe? That’s it. Its simple, but not necessarily easy as it takes some hard work and smart work to get there. You need to first identify your target/potential subscribers (ahem). It is crucial that you find out what they actually need and what their problem is. You need to do some background research to find out the solution to their problems. …And of course come up with your way of saying things and helping them. You need to do this in a consistent manner. You need to go the extra mile and help them outside your blog. In short you should build an empire of people who religiously love and listen to you – not just a list! You may provide this content in the form of blog post, free tutorials, free ebooks, whitepapers or in any form you prefer. For instance, I offer a free e-course called Blogging Success Foundation Course. My target audience are bloggers who want to get started properly and want to succeed with blogging. And the most common issue faced by them is lack of a proper foundation. So I created this course to give them the right mindset, teach them what to expect and what not to expect, and prepare them to do things right. You can check out the course information here. All this may sound overwhelming. But they’re worth it – coz these steps will absolutely help you to build a list of loyal readers or I can say fans! The future of internet will be (and is almost already now) connections. We connect with real people and do not put up content on webpages simply for the sake of it. Blog posts, email newsletter, ebooks, white papers, tweets, Facebook updates – all that we write are to communicate with people. We ultimately want to interact and connect with people. Your content should have that element which helps you to connect with people and successfully interact with them effectively. In other words, your content should be in-depth and as much informational as possible while at the same time be entertaining, engaging and lively. Write for your audience and write as you speak to them. Speak with your voice (do not adopt or copy someone else’s voice). If people know that you’re a real person who reads and responds to their emails, who is open to connect and who can help, they will surely respond by being responsive to your emails as well. Here you go – 3 simple, yet effective ways to build a highly responsive email list. The size of your list doesn’t mean anything except the money you have to pay to your email autoresponder company to own that list. Apart from that, the numbers really don’t matter. All that matters is how interested your list is to what you share with them. Is your email list filled with action takers? Are they willing to support your business? Are they willing to talk back to you? All these matter a lot. I hope you find these tips useful. 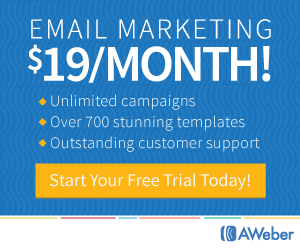 Apply them to build your responsive email list today! Got questions, suggestions or any other comments? Let’s talk in the comments section. Indeed building our email list grow is one of the task that each and every blogger ask about this. being opened by them we can add something extra interesting like e-books or free courses to our subscriber. Awesome post, Jane. Having a great Lead Magnet (freebie) makes a huge difference in how many people sign up for your list. I am still learning how to use email marketing for my blog. You’ve got a lot of great tips that will help anyone grow their email list. I haven’t taken the time to clean up my list. This is a great tip as the last thing we want is a bunch of people on our email lists that aren’t even interested in what you have to offer or say. I always make it a point to email my list every Friday. I’ve been doing this for a couple months. At first, it was hard to do because I only had 10 people on my list. Now it’s getting a little bit easier. I still don’t have a lot of people on my list, but I finally hit my first 100 subscribers. I still email them every Friday. I’ve found that this improves my open rates because they know they’ll get an email every Friday. Getting rid of cold subscribers is important, and they can truly lower your costs on a monthly basis. Yet, there is something I don’t like how certain email service providers handle the unsubscribed persons. For instance, AWeber says, that: “… unsubscribed addresses count toward your total number of subscribers (and thus the cost of your AWeber account”.